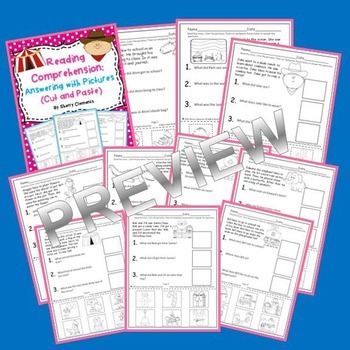 This 15 page reading comprehension pack includes a short story with a black and white picture which students may color. Each story and related questions are on a full page. Under each short story, there are three questions about the story. At the bottom of each page, there are 6 choices for the answers to the questions with only 3 being correct. Students will cut and glue the correct (picture) answer for each question in the space provided. The 15 stories are shown in the preview. There are many uses for these stories/questions. 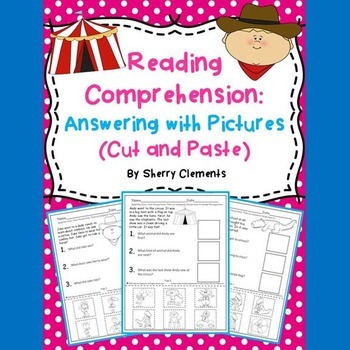 They can be used in a kindergarten class with the teacher reading the story and questions to the students and having the students cut and glue the pictures for their answers. They can also be used for independent reading practice in first or second grade by letting students read the short story, read the questions, and answer the questions even if they have to look back in the story to find the answer (finding evidence) (close reading). These short stories are great for guided reading groups, homework, a mini lesson, or literacy center activities. I hope your students enjoy these stories and questions. © Sherry Clements. All of the activities included in this resource are the intellectual properties of Sherry Clements. 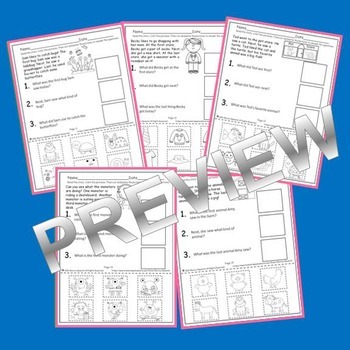 This resource is for one classroom use and is intended for the purchaser. Duplication for other classes, by other teachers, or for use in wide distribution such as a school district or on the internet is strictly forbidden unless multiple licenses are obtained. You may not re-sell or claim this product as your own. Violations are subject to the penalties of the (DMCA) Digital Millennium Copyright Act. Be sure to FOLLOW ME to be notified of new resources, freebies, and monthly FOLLOWER FLASH FREEBIES!